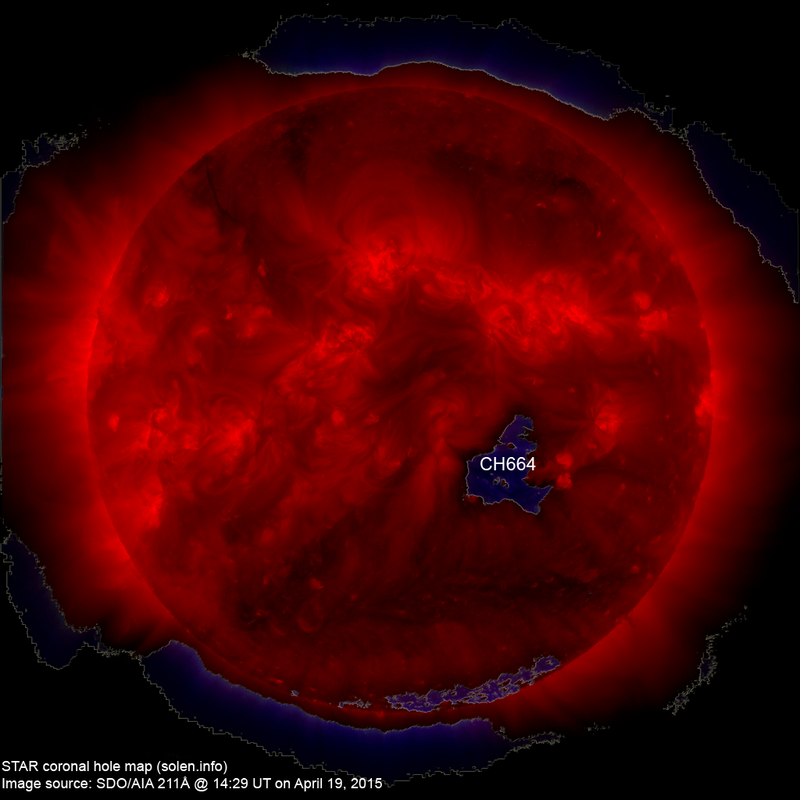 The geomagnetic field was quiet to active on April 21 under the influence of a high speed stream from CH664. 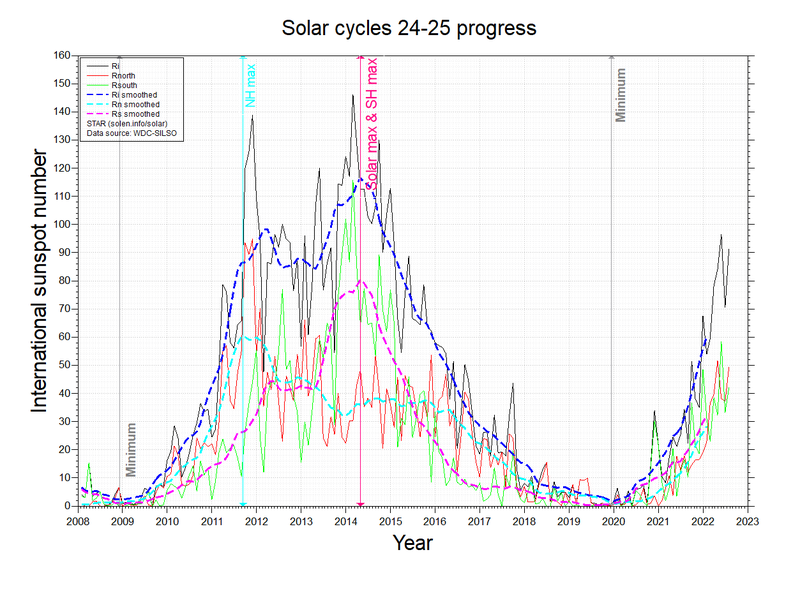 Solar wind speed at SOHO ranged between 522 and 601 km/s. 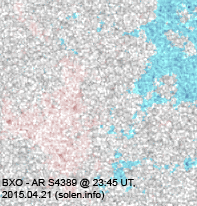 Solar flux at 20h UTC on 2.8 GHz was 153.8 (increasing 16.0 over the last solar rotation). 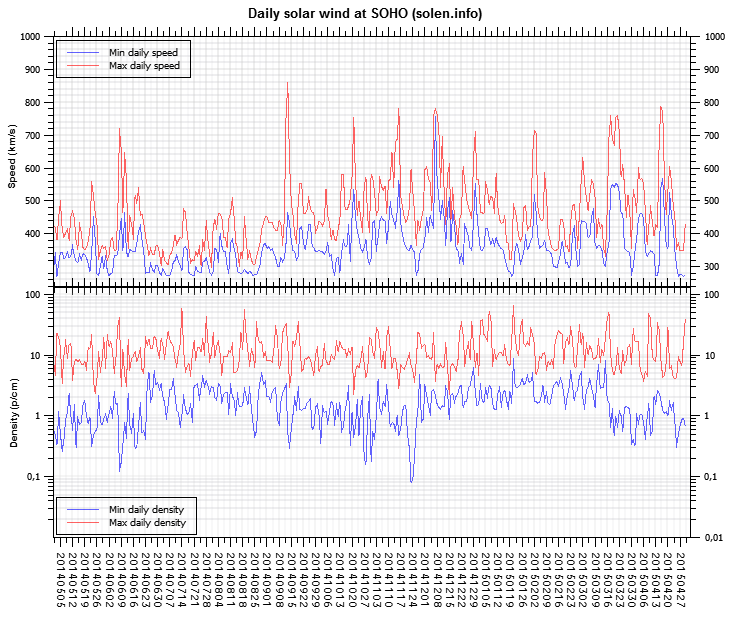 The 90 day 10.7 flux at 1 AU was 128.6. 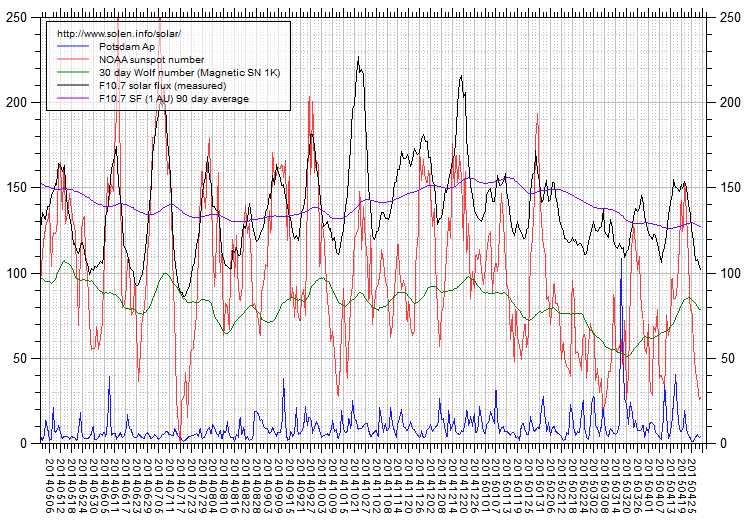 The Potsdam WDC planetary A index was 19 (STAR Ap - based on the mean of three hour interval ap indices: 18.6). 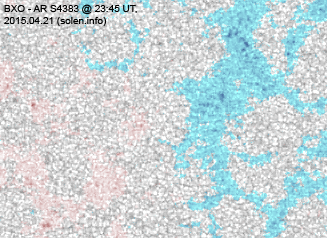 Three hour interval K indices: 43344323 (planetary), 33334423 (Boulder). 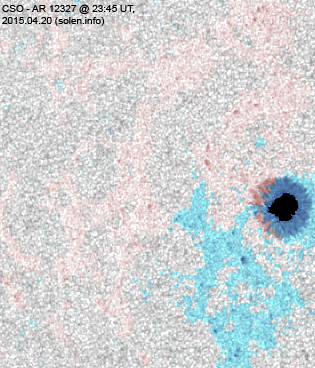 At the time of counting spots (see image time), spots were observed in 19 active regions using 2K resolution (SN: 357) and 15 active regions using 1K resolution (SN: 224) SDO images on the visible solar disk. Region 12321 [N13W66] decayed slowly and quietly. 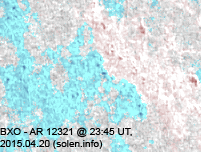 Region 12324 [N19W32] was quiet and stable. 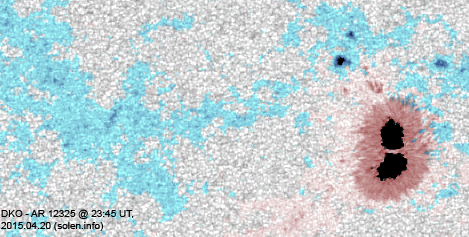 Region 12325 [N04W24] developed slowly and was mostly quiet. 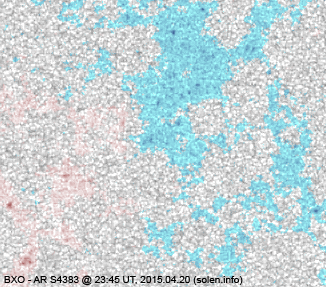 Region 12326 [N13W56] was quiet and stable. 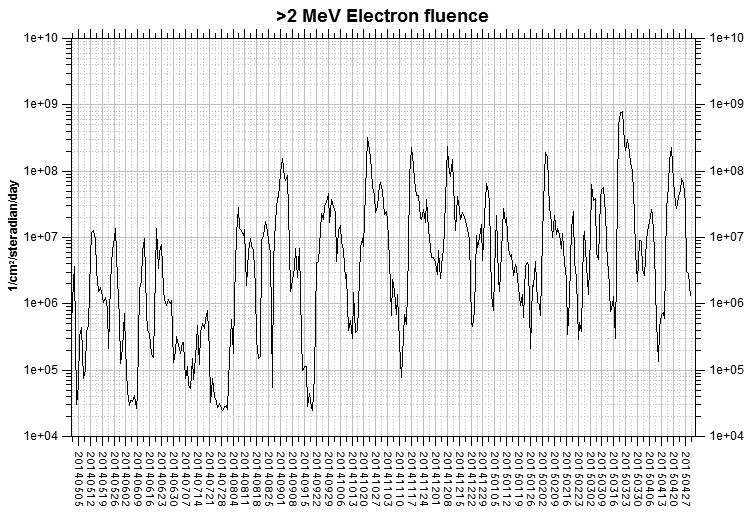 Region 12327 [S09E18] was quiet and stable. 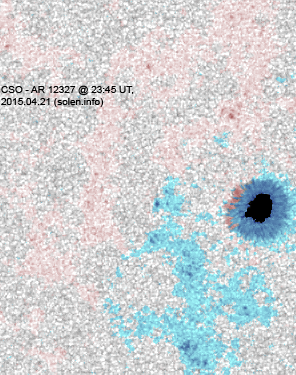 Region 12329 [S08W77] developed in the leading spot section while decay was observed in the trialing spots. Region 12330 [N15E18] decayed slowly and quietly. 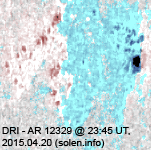 New region 12331 [S10E09] rotated into view on April 17 and was numbered by SWPC four days later as new flux emerged. 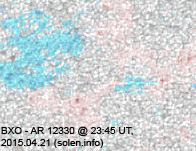 New region 12332 [S13W16] was first observed with spots on April 18. 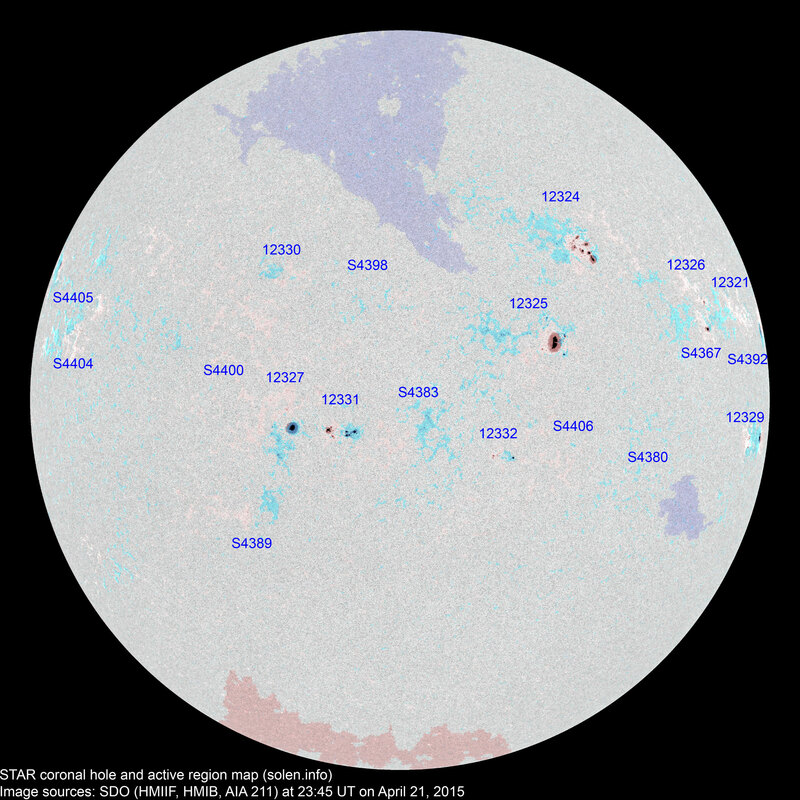 New flux emerged on April 21 when the region received its NOAA number. S4367 [N08W57] decayed slowly and quietly. 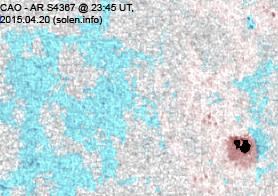 S4380 [S15W56] reemerged with a penumbra spot. S4383 [S09W02] was quiet and stable. S4389 [S22E27] was quiet and stable. 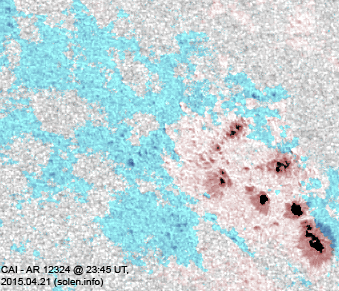 S4392 [N10W84] developed quickly early in the day as a compact region with an increasingly strong magnetic delta. The region produced several M class flares with further flaring possible today as the region is transiting the northwest limb. S4398 [N11E05] was quiet and stable. S4400 [N05E27] was quiet and stable. New region S4404 [N08E64] rotated into view with penumbra spots. 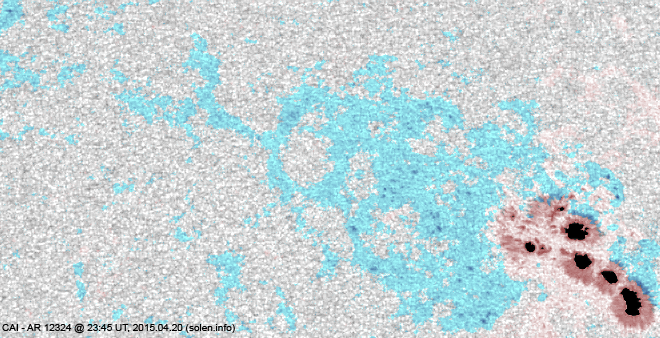 New region S4405 [N20E79] rotated into view. New region S4406 [S11W38] emerged with penumbra spots. 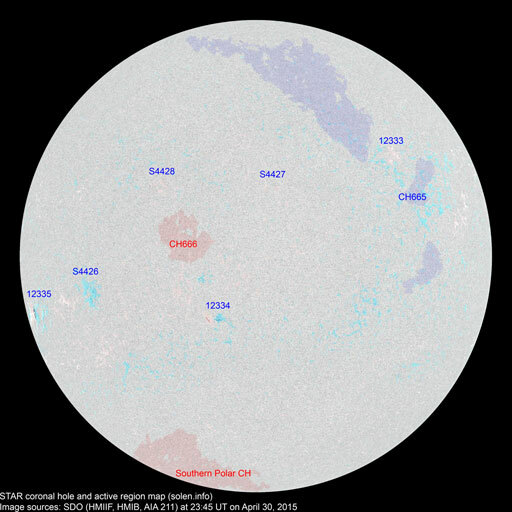 April 19-21: No obviously Earth directed CMEs were observed.